Let's talk about mayo! It's not exactly the prettiest dish in the world, but when the Whole 30 limits the condiments that you can eat, mayo becomes your friend. I never liked mayo as a kid, but as I got older, I developed a taste for it. Now I couldn't imagine a burger or a club sandwich without copious amounts of mayonnaise and call me European, but I love it on french fries! My friend (and Beautycounter business partner! 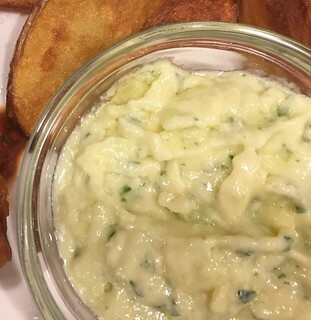 ), Melissa shared how she made mayo with her new immersion blender on her blog over the weekend. And I had made mayo in the past with my mom and her immersion blender, so I wasn't exactly sure I could make mayo without a "stick blender!" So when Reid and I decided to tackle mayo for our potatoes, I got out the big blender, put an egg yolk in it, then regretted it and poured my yolks into a bowl. 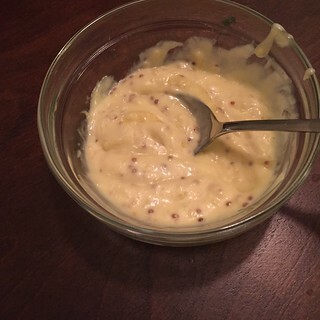 I didn't want to have to scrape the inside of the blender to get the mayo out when I was done, so I tasked my guy to whisking the mayo base while I SLOWLY added the oil! Combine your mayo base and whisk continuously as you drizzle in up to 2 cups of the oil of your choice - Extra Light Olive Oil and Avocado Oil both work REALLY well. You're creating an emulsion, so don't add your oil too quickly or it will separate in the fridge. You literally work drop by drop with the oil, and it goes from super thin to mayo consistency almost instantly. Like one drop its thin and then next it's done! As far as adding flavors goes, you take that awesome yummy base that you just made and the sky is the limit with flavors! I added a spoonful of whole grain mustard and minced garlic to make the mustard-garlic version, and added 4 cloves of chopped fresh garlic with a handful of chopped cilantro to make the cilantro lime version. I should probably mention that my chopping secret weapon is this Pampered Chef chopper. I have tried other brands and the pampered chef one is the BEST by far! I can say that with certainty because I broke both the slap-chop and the Oxo version after using my sister's PC one for years when we shared a house. Pampered Chef for the win! This is what I use to chop everything, even though I have pretty good knife skills, a garlic press, other cool PC chopping tools (like this). I've even put off getting a food processor for things like ricing cauliflower, because this chopper does the trick! That's how easy making mayo is! Let me know how you like to doctor up your mayo!